Thank you for keeping our buildings warm, our transmitter humming and our spirits high. As we approach the halfway point of our long winter, we offer you our most sincere gratitude. We cannot say it enough: You are the strength of this Catholic mission radio station. We sympathize with our many friends whose winters have been as nasty as ours. May you be warm and well. We remember each of you in our prayers. MAKING WAVES (left): With audio waveforms on two computer screens, KNOM production director Mike Nurse skillfully creates educational spots and programs. �The Two Brothers� is one of 46 traditional native stories which Mike has produced. Part of our long effort to honor and help preserve Eskimo culture, the shows air weekly on KNOM. We consider such gifts to be sacred, and we prayerfully place all bequests into funds that will provide for future major improvements, and will protect the mission against unforeseen future emergencies. INSPIRATIONAL SPOT: Can you think of ten persons or things to thank God for? Take time right now to thank Him for just one of them. top THIRTY YEARS AGO: February 1973, Nome was �invaded� by 3,000 members of the U.S. Army and Air Force , in the area for winter training. That more than doubled Nome�s population. 1,000 at a time came to town on passes, and Nome�s seven bars did standing-room-only business. (Left) That month, Peter Van Nort arrived from Sacramento, CA as a KNOM volunteer. 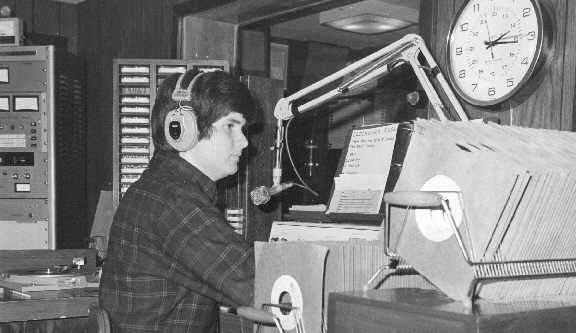 Note that a 45 RPM record is playing on the air behind Pete. 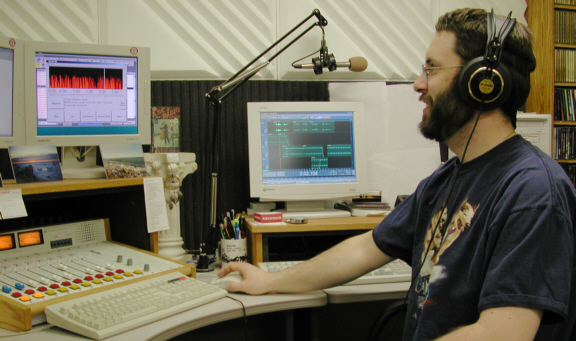 Following a volunteer year, he moved to Fairbanks and was employed by radio station KIAK. Pete wound up managing KIAK for many years, and has continued to serve as an active KNOM supporter. For example, it was Pete who produced KNOM�s live Fairbanks coverage of Bishop Michael Kaniecki�s funeral in 2000 and Bishop Donald Kettler�s ordination in 2002. �LIGHT� TOPIC: It�s time to replace the beacon on the KNOM tower. At present, this bright flashing red light consists of two 620-Watt incandescent light bulbs. Their companions are two 120-watt side lights halfway up the tower. These lamps are expensive to operate. They burn about $1,100 worth of electricity every year, and it costs about $2,000 to fly up a two-person tower crew to replace them every year. A while back, we discovered during one of those replacements that our 33-year-old beacon assembly is corroding and will eventually need replacement. It�s been on our list of needed projects. We�ve been waiting for a new technology to be proved, and it has been. Today, we can replace the old lamp technology with light-emitting diodes, or LED�s. These assemblies use 90% less electricity than the old bulbs and have a rated lifetime of ten years or more. Over ten years, they will save our mission up to $30,000. The replacement may cost one-third of that. We�re working on an estimate, and will have a report for you in April or May. UNEXPECTED VISITOR: On January 28th, a U.S. Air Force E-3 Sentry plane, better known as an AWACS (for airborne warning and control system), circled Nome a couple of times. The airplane then approached the Nome airport with gears down, as though landing. After a few seconds, the wheels came back up and the plane flew away. The Air Force would not comment. The AWACS is a modified Boeing 707, distinctive for its 30-foot diameter radar dome. Nobody could remember previously seeing one in this area. INSPIRATIONAL SPOT: Being a Christian is offering yourself to God; your mind for Christ to think, your heart for Christ to love, your lips for Christ to speak, your hands for Christ to reach out and help others. Christ has a lot to do before your life is finished! INSPIRATIONAL SPOT: When we truly Love God, there is no room for self. top MANY HAPPY RETURNS: We�re delighted to report that KNOM volunteers Amy Flaherty (at left) and Julia Dunlap (at right) have signed up for a second year. Julia will continue as news reporter and public affairs correspondent. Amy will continue producing our morning show, public affairs interviews, and focus on a long-term project �Elder Voices,� in which each half-hour program features the thoughts of one elder from this region. We thank God for the service of these two generous and talented young women. INSPIRATIONAL SPOT: He�s the patron saint of Poland and Lithuania who is remembered not as a conquering hero, but one who refused to lead an unjust war. Casimir was born to royalty, at a time when royalty was big in Europe. His father was king of Poland, and in the system of alliance by marriage, his mother was daughter of the German emperor. Casimir was said to be attracted to living by Christ�s example early in life, but his father had other plans. About the time Columbus was learning to use the compass, Casimir was ordered by his father to lead an army against the Hungarian king. Casimir thought the cause was unjust, and refused. He was 13 at the time. Casimir was placed under house arrest in the castle, and used the time for study and prayer. Still, Casimir and his father got along well enough that he administered the nation while the king was away. He led a chaste, holy life, dying of consumption at the age of 23. His feast day is March 4th, the anniversary of his death in the year 1484. · God is absolutely, without a doubt, head-over-heels crazy about you! · He sends you flowers every spring, and a sunrise every morning! · He could live anywhere in the universe, but he chose your heart! · His Love is incredibly special -- just like you! top PSST! (left) It�s a secret! Please don�t tell anyone that KNOM engineer Les Brown doesn�t really stay up all night deejaying midnight to six, seven days a week. 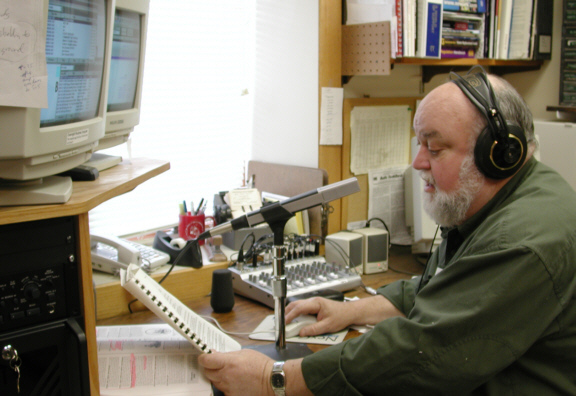 Though he sounds live, Les �voice tracks� the overnight show from a nook in the KNOM engineering shop. Voice tracking involves recording song introductions and announcements which our computer plays at the appropriate times. Another secret: Les records his overnight shift announcements two weeks in advance! But he does sound live, and his deep Stentorian voice is an overnight companion for many listeners across thousands of square miles. UP IN THE AIR: The past few weeks have seen KNOM�ers on the move. 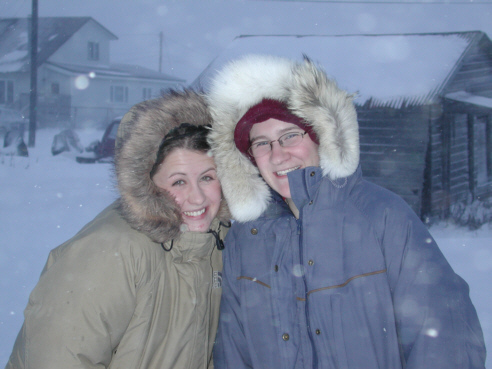 Volunteer Emily Barrett flew 117 miles to the Yup�ik Eskimo village of Stebbins, to cover their annual Eskimo dance festival, where she reported on the gathering for KNOM listeners and recorded native songs in high quality stereo. For volunteer Amy Flaherty, it was a trip to White Mountain, which held a village-wide feast in honor of their neighboring village of Golovin, and especially in honor of Golovin�s elders. Program director Ric Schmidt was off to Anchorage for a gathering of the Alaska Broadcasters Association, of which he�s vice president. And general manager Tom Busch traveled to Dallas to participate in the New Evangelization of America conference, held in response to Pope John Paul II�s encyclical �Ecclesia in America.� Tom noted that both Dallas Co-Adjutor Bishop Joseph Galante and the Vatican�s president of the Pontifical Council for Social Communications, Archbishop John P. Foley are fellow graduates of Tom�s high school, St. Joseph�s Prep in Philadelphia. Thank you once again for your prayers and your financial support. May God greatly bless you for your goodness to the remote Alaskan village families whom we serve.